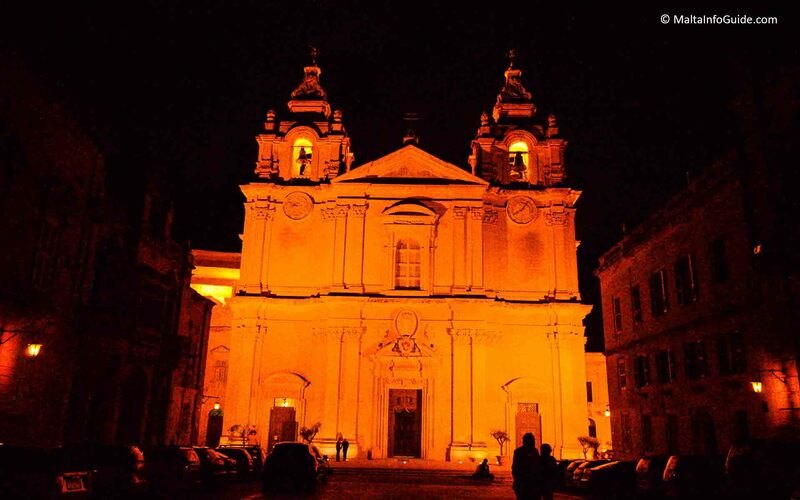 Images of mdina photos by night are another reality and so attractive. It draws people to come here walk along the narrow streets without any vehicles except for those who live here. After dark, however, when the coach-loads of people have departed and the main attractions have closed their doors, this really is the Silent City. It's still very pretty though and very atmospheric, making a trip here after dark well worth the effort if you prepare properly. You can get away without lights, however, if you time your trip so it's at the same time, or close to, a Full Moon. The bright moonlight creates a unique hue on the normally golden coloured buildings and for romantic couples there is nowhere finer to spend a few hours. The main entrance from the main gate known as the Vilhena gate. It is seen from the back. On the left the Grand Masters Vilhena's palace now housing the National Museum of Natural History. On the right side the Torre Dello Standardo built on 1725 forms part of the fortifications. It was built by the Knights of Mata to communicate signals to all areas around the island. Today it is a tourist information office. A short walk takes you from the centre to the back bastion walls. From here you have a spectacular view right over most of Malta. The Mosta lit church dome is very much visible surrounded by many street lighting of the villages. Coming here in the evening is even more pleasing, no punishing sun just fresh especially here. You can sit or lean on to the high bastion wall observing the view. The Cathedral is the main landmark within the ancient city. The Roman Catholic Metropolitan Cathedral of Saint Paul was built in 1702 in the baroque style by Maltese architect Lorenzo Gafa' . This is a richly decorated, beautiful cathedral with lovely unique architecture. It is huge in the main square but it is remarkable. Palazzo de Piro is adjacent to the Cathedral on the right side through a narrow short road. It was part of Saint Dorothy's church school. Now it has been renovated and fully functional conference and catering centre. 17th Century palazzo was built by the Maltese architect Girolamo Cassar and his son Vittorio. The building at the back is incorporated with the bastion wall. You will surely be walking from here to the popular Fontanella tea room with narrow streets and ancient buildings around. The Trattoria AD 1530 is a splendid location for al fresco dining especially in the evening. It forms part of the Xara Palace Relais 5-star boutique hotel. It is located at the side in the small square directly in front of the Vilhena palace. A night aerial view over the bastion from another location. You can see the view of Malta towards the Malta International airport up to Birzebbugia Freeport Terminal all surrounded with villages. In the centre you can see up to Valletta. The view is even nicer if there are summer village feasts with aerial fireworks in the distance. The Gharreqin gate is one of the three archways to enter Mdina. It is the least known. It was opened in 1890 when the train used to stop at its final station outside Mdina just before the valley bridge crossing to the British military barracks at Mtarfa. This gate was ideal to shorten the road to enter through the fortifications. There are no stone work designs only for the convenience of access. The typical atmosphere in the evening through the narrow winding streets dimly lit with tall buildings on each side. This is a real experience one can do where it is free to go round in total safety in a completely quiet environment. This photo depicts many beautiful facades of this city with the effects of street lighting. 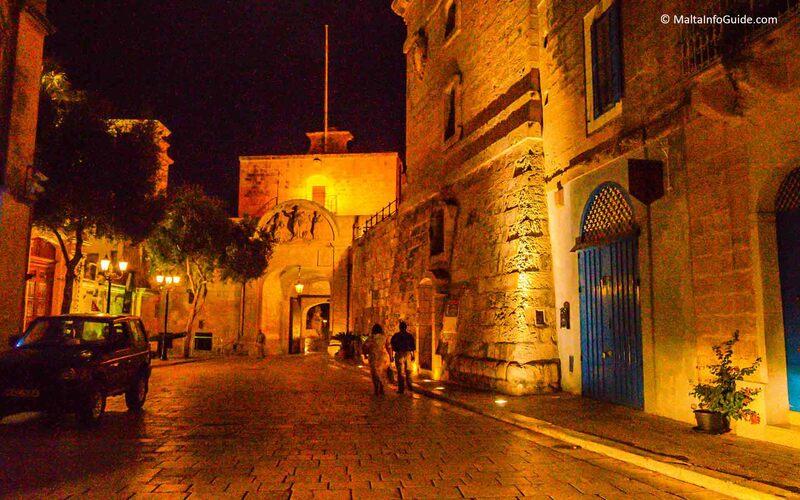 Walking through gives you a peaceful atmosphere and enjoying the silent city as Mdina is called. 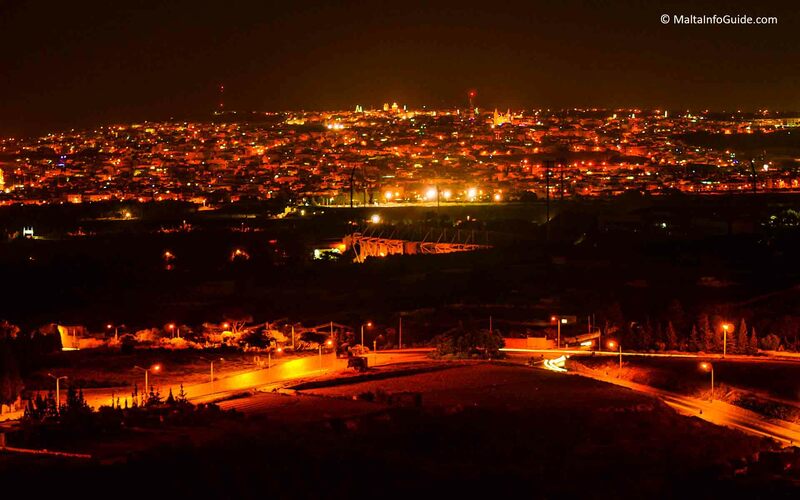 At night the fortifications and cathedral landscape are visible from far away. It is even more an attraction when illuminated during the night. On driving up to Rabat you will definitely not miss it when you see this beautiful cathedral and fortifications all lit up to give it a spectacular atmosphere. It is the most enchanting place and definitely worth a visit. A magical location to visit, enjoy and dine in one of the restaurants like the locals do. 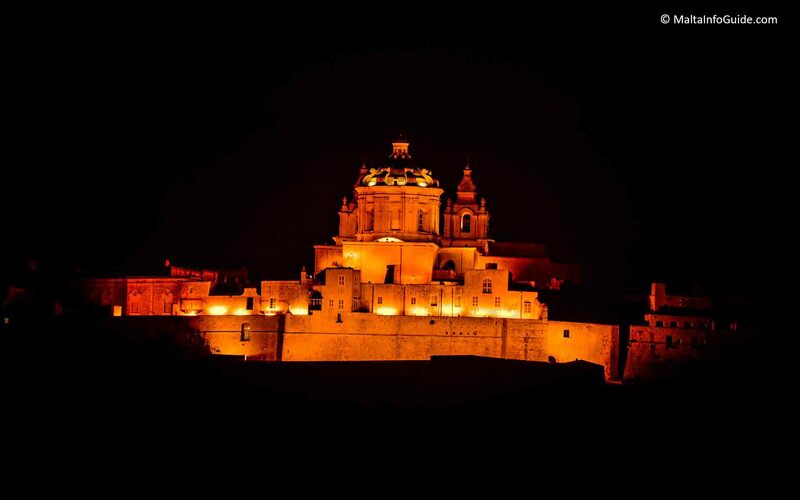 Malta Mdina night photos brings you a glimpse of what you can see.